THE overgrown thicket near their kasi was a place of evil where criminals could hide and killers would dump their victims. So when the body of an innocent two-year-old was found in the bush next to Thabo Mbeki squatter camp in Cape Town at the end of August, residents decided to act. On Sunday they came with pangas and axes and cut down the shrubs and bush. 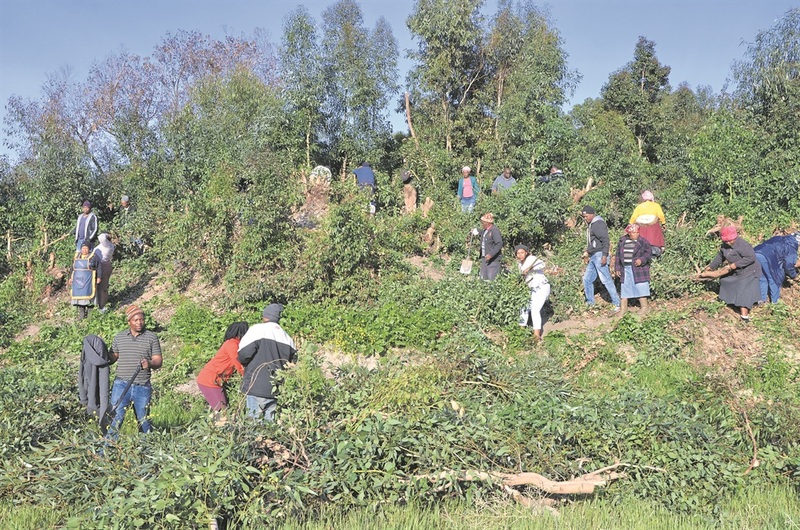 Community leader Buzwe Kani said they had asked their councillor to ask the City of Cape Town to come and clean the overgrown area, but nothing came of it. “We are sick and tired of people turning this place into an evil place by killing people and dumping them here. The City will just have to finish what we started.” said Kani. Daily Sun published the sad reports of missing Oyingcwele Zokufa (2) who disappeared from his home on Sunday 26 August and whose body was found in a shallow grave in the bush four days later. “If our pleas had been answered that child would not have been buried here,” said a resident. Linomtha Majola (38) said they feared the next kid to be found in the bush would be from Thabo Mbeki. She added that the last incident hit them hard and said as a community they were hurt. “No parent deserves to experience what his mother is experiencing. “Cutting these bushes down is also our way of saying we feel the pain of the family,” said Majola.